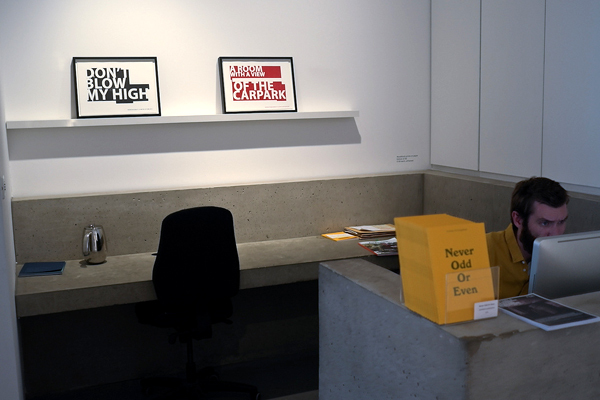 It’s the last week of Thomson & Craighead’s Never Odd or Even at Carroll/Fletcher. 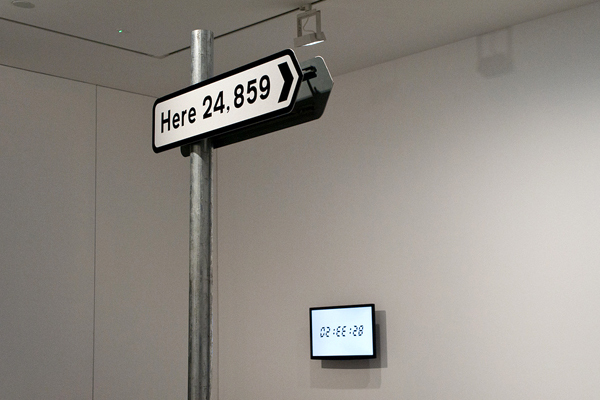 The London–based Jon Thomson & Alison Craighead work together since the 90s, with Internet and information technology as main sources of inspiration. They have exhibited widely on festivals, participated in many group shows, but this is their first major solo exhibition in a London gallery – and causing a bit of a sensation. on how the Internet and technology influence our ways of thinking and perceiving and uses these same technologies to demonstrate it. 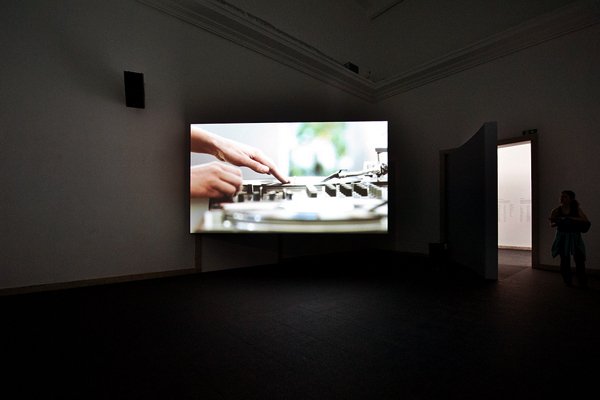 But calling Thomson & Craighead “new media artists” doesn’t do them justice. 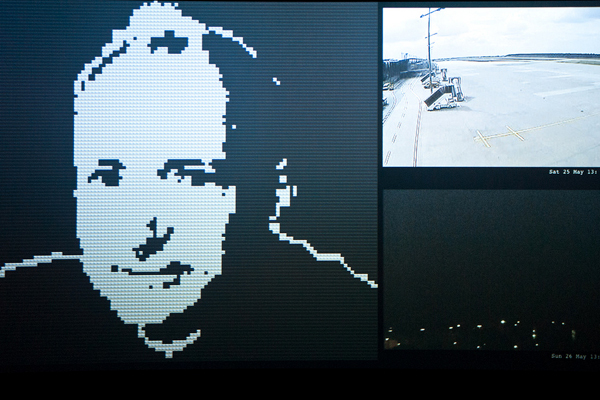 Their pieces show much deeper passion and fascination with digital world than the label would suggest, with constant references to the broader digital culture – sometimes with a wink to the geek or the gamer but always accessible to people less familiar with bits and bytes. 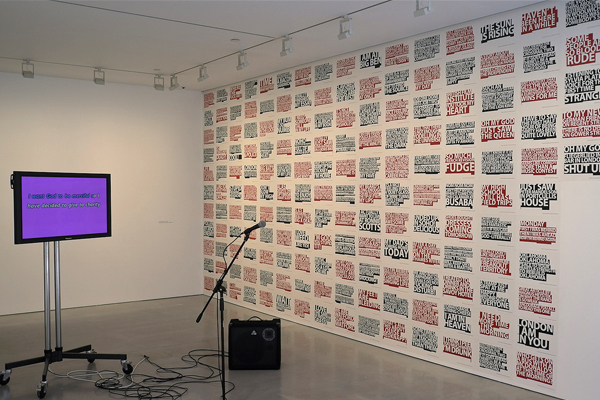 Works on display include giant wall of tweets offering a poetic snapshot of a social networking traffic within a defined geographic area; karaoke set with spam email lyrics; modified arcade game that invites you to shoot at Foucalt’s text instead of at Space Invaders (yeah! ); or video installation of self-appointed prophets using social media to recruit followers (see our flickr set for more photos). If you want to find out more, there’s an interview of the artists with Morgan Quaintance. Also We Make Money Not Art has interviewed them for the weekly radio series Artists in Laboratories, (recordings of most interviews are available on Soundcloud, with new ones uploaded regularly – check them out). 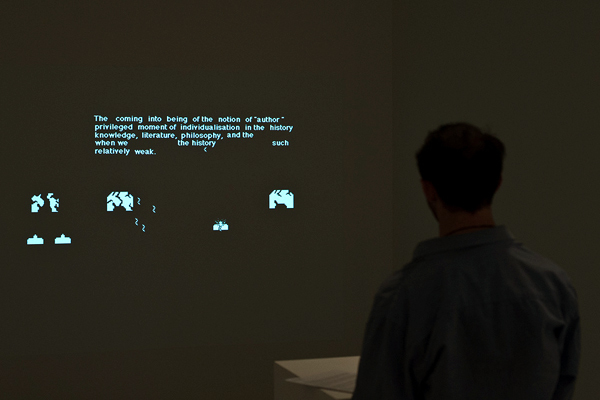 Never Odd or Even runs at Carroll/Fletcher till July 13th. Go, see and play! and the beauty of its graphical execution, or dive in deep semiotic analysis. Although two-dimensional, it seems to transform the space around. The original show “Live in Your Head. When Attitudes Become Form” was curated by Harald Szeemann at the Bern Kunsthalle in 1969 and celebrated for its innovative take on exhibition practice. Completely restaged at Ca’ Corner della Regina with the original works and even the interior setup, it has some amazing pieces on display which you’re not likely to ever see again (many of them are in private collections and the rest is all over the world) plus an eerie effect of a time travel. 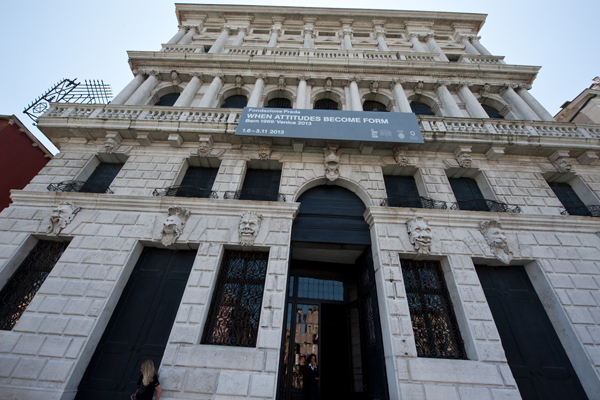 It was curated by Germano Celant in dialogue with Thomas Demand and Rem Koolhaas. 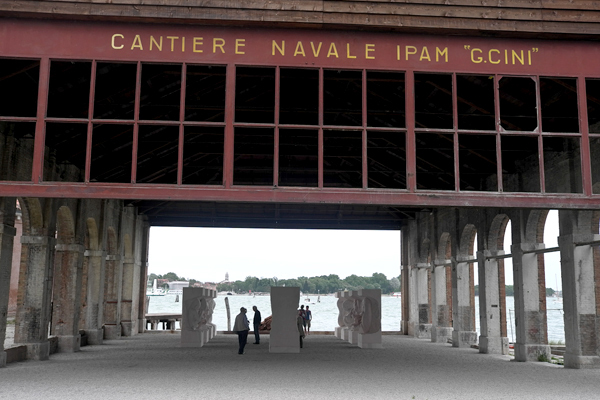 Quinn‘s big solo show is on the island of S. Giorgio Maggiore, a great destination on itself, with wonderful views of the city and a unique atmosphere. The artist’s monumental shell sculptures look splendid here; the even bigger Alison Lapper pregnant is like an elephant in china store, but that’s probably the point. 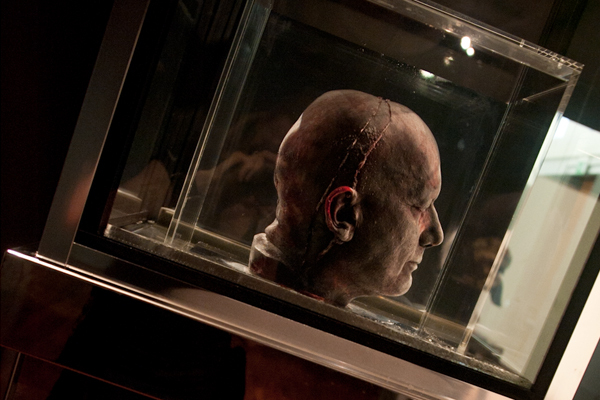 From the works inside, the most impactful is still his frozen blood self-portrait. 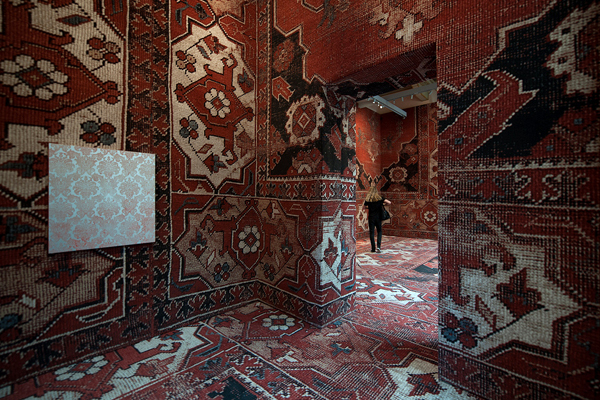 We also loved how the embryo sculptures outside seemed to have emerged right out of the laguna; and this carpet! 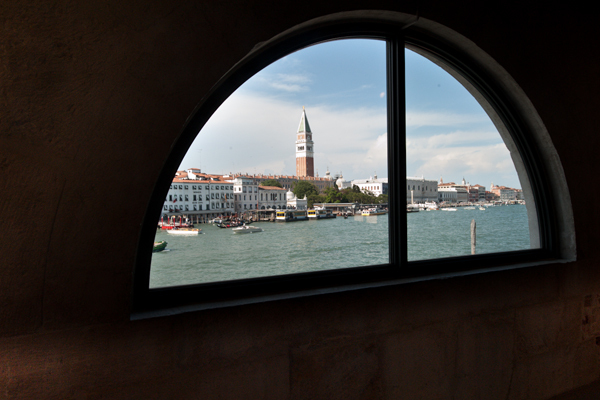 One of François Pinault’s spectacular locations (the other is Punta della Dogana) hosts a solo of Rudolf Stingel. One floor of abstract, and another floor of figurative paintings (hyperrealistic portraits of religious statues) offer good comprehensive view of Stingel’s recent work. 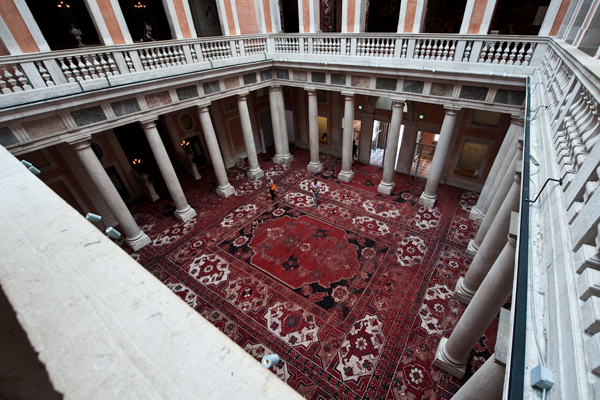 The most impressive is however how the artist transformed the space of the palazzo: the entire interior has been “upholstered” with persian low-res carpet tapestries. When we were there, we were almost the only visitors and felt like being lost in a real-life computer game. The contrast between the dark, soft and silent interior and the strong sunlight and city noise coming in through the windows makes the whole experience even more bizarre. 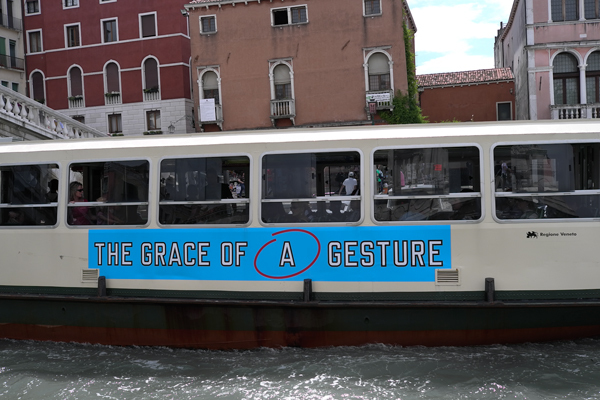 Last, but not least, a nice digital, rather than physical intervention from the Dutch artist Jonas Staal: Ideological Guide to the Venice Biennale, a downloadable app that provides insight into its political, economic and general ideological infrastructure. 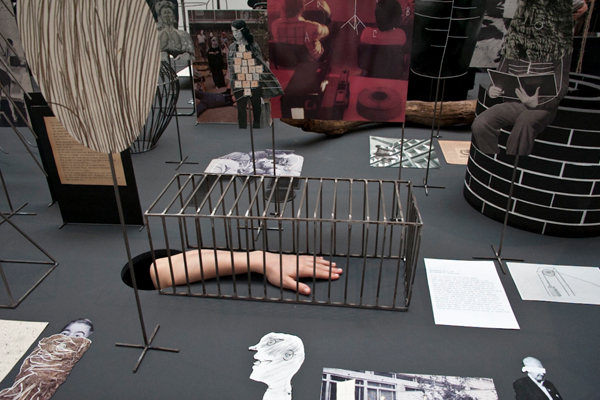 Hand (FR), Berlinde De Bruyckere‘s Cripplewood installation (B) and Gilad Ratman’s Workshop about a fictional underground journey from Israel to Venice (IL). 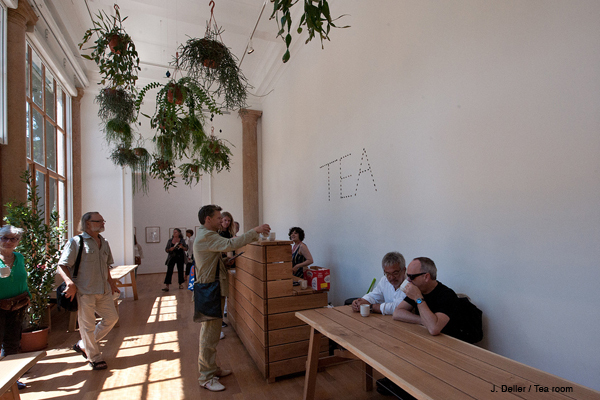 “I wasn’t really sure what to do with this room, so I thought it might be nice if people could relax and have some tea.” Easily most fun we had at the Biennale. Albanian-born Anri Sala transformed the French pavilion (technically the German one, as FR & D swapped to make a statement) into a grandiose concert hall/theatre with 3 cinema stages. 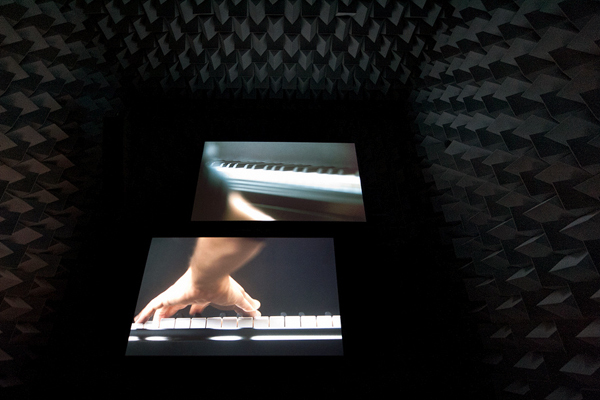 In the centre room, two simultaneously projected films show hands of pianists playing Ravel’s 1930’s composition Concerto in D for the Left Hand, in an impression of a musical race. 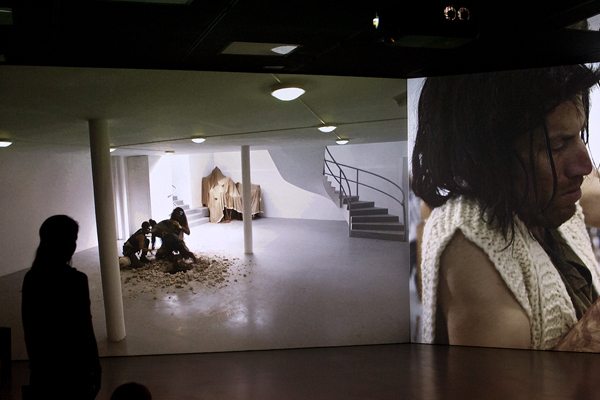 Two other films are shown in adjacent rooms, showing a DJ mixing the performances, and uniting them into a single piece. De Bruyckere worked closely with writer J.M. Coetzee (who together with Philippe Van Cauteren curated the pavilion), to create a stunningly beautiful, poetic and touching installation of a “wounded” tree trunk lying inside a darkened room. It looks great on photos and even better in real. Group of “cavemen” led by Ratman digs an underground tunnel from Israel to Venice, resurfacing right in the middle of the Israeli Pavilion. 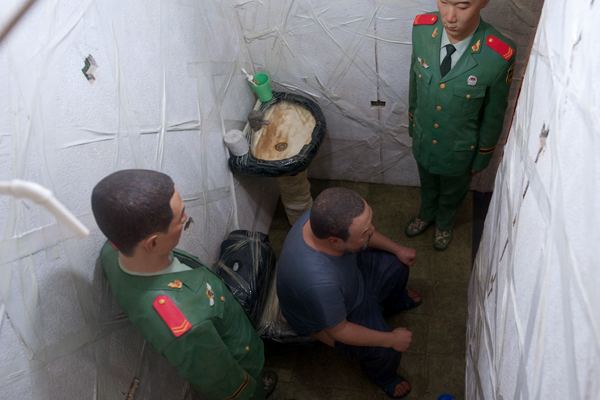 Once there, they sculpt their portraits from imported Israeli clay. The displayed movies document fragments from this absurd fictive journey amongst series of clay portraits mounted on poles. 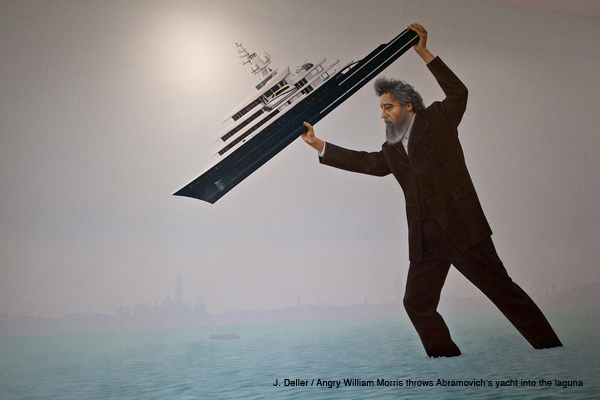 Don’t miss also Sarah Sze‘s Triple Point @ the US Pavilion; Terike Haapoja @ the Nordic Pavilion; Jesper Just‘s Intercourses (Denmark); and Konrad Smolenski‘s Everything Was Forever, Until It Was No More (Poland). 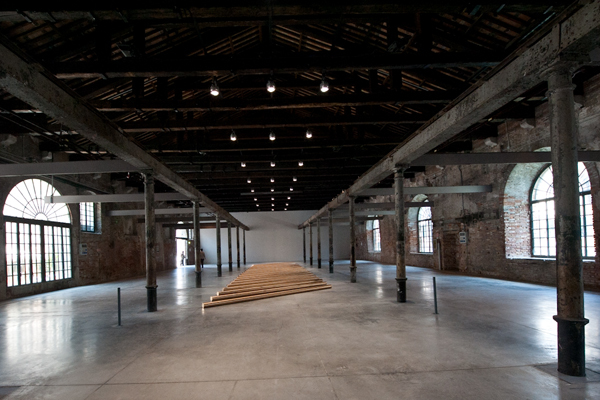 Outside of Giardini, go see the unusual and exciting curatorial setup by Raimundas Malasauskas for Lithuania & Cyprus in a huge underground gym located near Arsenale, and Alfredo Jaar‘s appearing/disappearing model of Giardini @ the Chilean Pavilion in Arsenale. 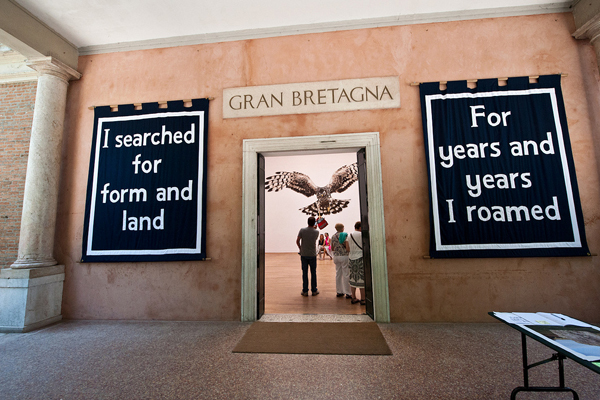 Angola won the Biennale’s Golden Lion with Edson Chagas‘ Luanda, Encyclopedic City photo installation, but especially the fact that it’s staged at the amazing Palazzo Cini Foundation makes it a must-see destination. 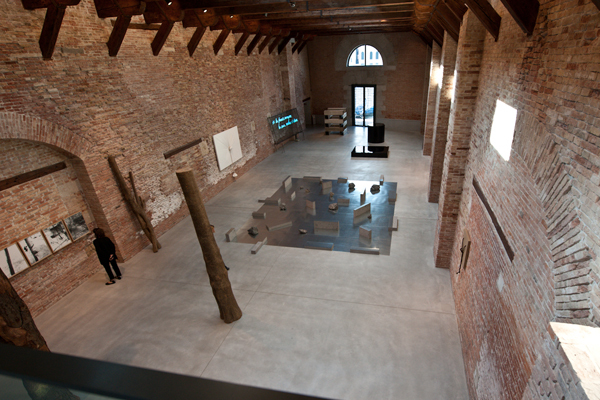 The Encyclopedic Palace is a title of the main exhibition of this year’s Biennale, which is on display in Arsenale and in the Central Pavilion in Giardini. 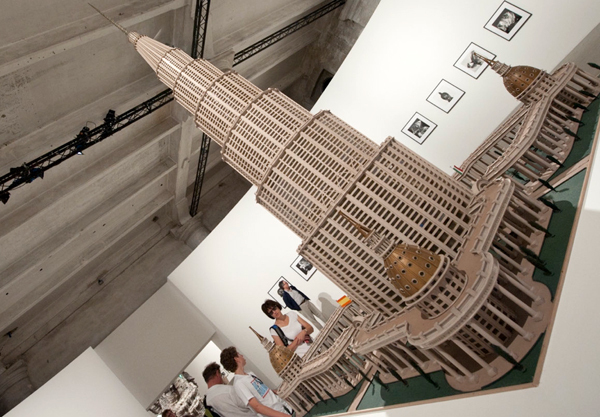 Curated by Massimiliano Gioni, the title refers to an unrealized project dreamt up by an Italian immigrant Marino Auriti (1891–1980), of a museum documenting all human endeavors inside a 700m-tall “Encyclopedic Palace of the World”. Auriti hoped that his palace would become “an entirely new concept in museums, designed to hold all the works of man in whatever field, . . . everything from the wheel to the satellite“. Alas, the project only materialized on the scale of a architectural model created by Auriti during his retirement. But Auriti’s dream serves as a metaphor for creative pursuits outside the mainstream, for our desire to collect and to catalogue, and as tribute to all visionary, crazy minds. 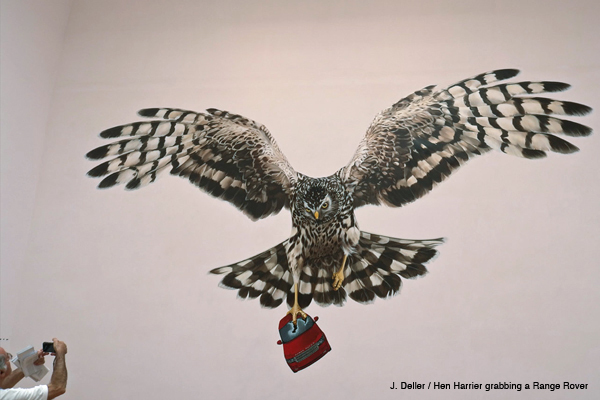 “Auriti not only encapsulates some of the themes of the show, but he also came to incarnate one of the exhibition’s larger questions, which is the distinction between the professional and the self-taught, or the professional and the autodidact. 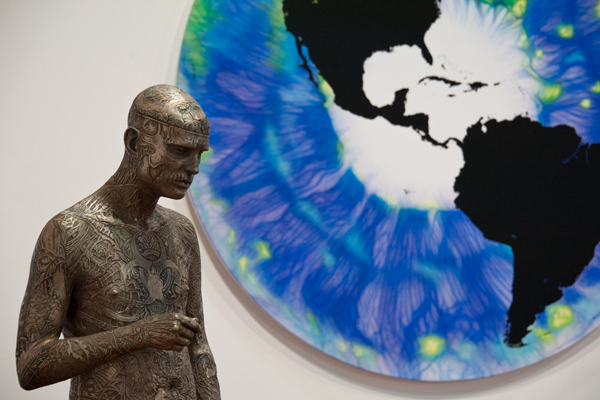 By blurring this line, the exhibition takes an anthropological approach to the study of images, focusing in particular on the realms of the imaginary and the functions of the imagination. What room is left for internal images—for dreams, hallucinations, and visions—in an era besieged by external ones?”, says Mr. Gioni, who can surely relate to some extravagance. Early in his career (he’s now director of the New Museum in NY), he used to act as a doppelgänger of the artist Maurizio Cattelan. Ancarani‘s hallucinating video shows an entire robotic surgery operation. The robot, called Da Vinci, is being controlled by a human surgeon. Schmidt‘s photos explore various aspects of industrial food production in Europe by documenting factory farms, grocery stores, slaughter houses, dairy farms etc. 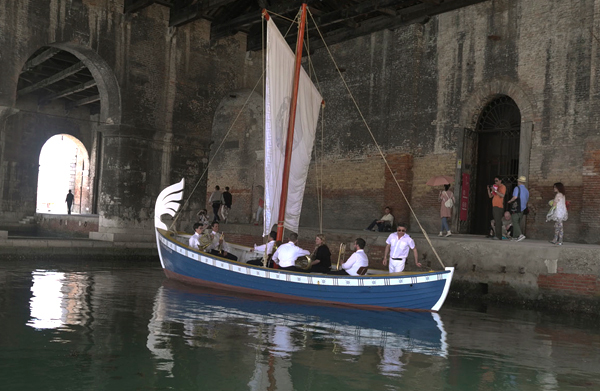 Icelandic artist Ragnar Kjartansson built a hybrid version of Greek, Icelandic and Venetian vessel that sails through the Arsenale canals with a brass band onboard. Paulo Nazareth wanders the world, collects products and uses them in installations. The ones exhibited here all have names of saints (of his mother) in their titles. Steyerl‘s funny instructional video informs us “how to remain invisible in an age of image proliferation” (one suggested tactic: become smaller than the size of a pixel). 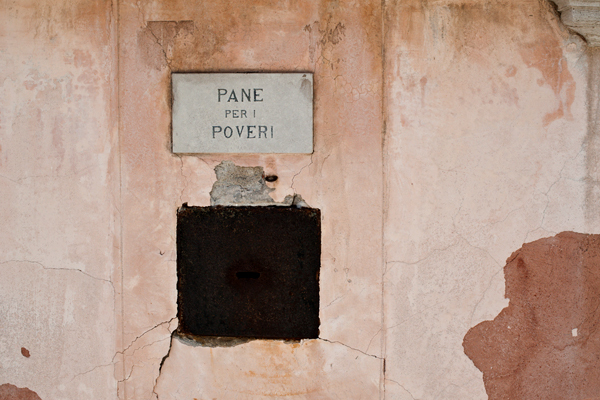 Biscotti‘s minimal sculptures were produced from compost bricks, using pooled rubbish from the cells, kitchen and garden of the Venezia-Giudecca female prison, where the artist held weekly “dream” workshops (sharing conversations and dreams with the detainees). 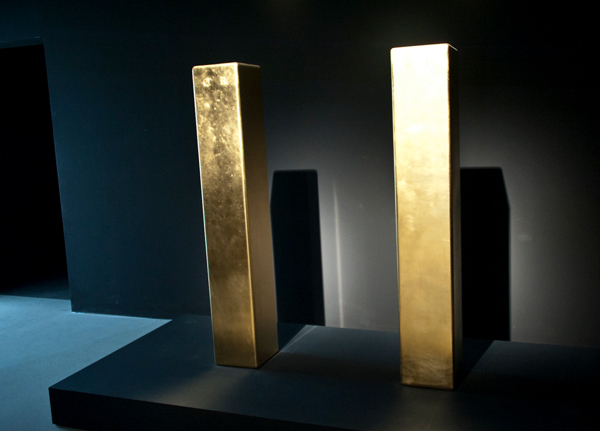 One of De Maria‘s sublime multipartite installations: group of 20 solid bronze rods arranged according to precise calculations. 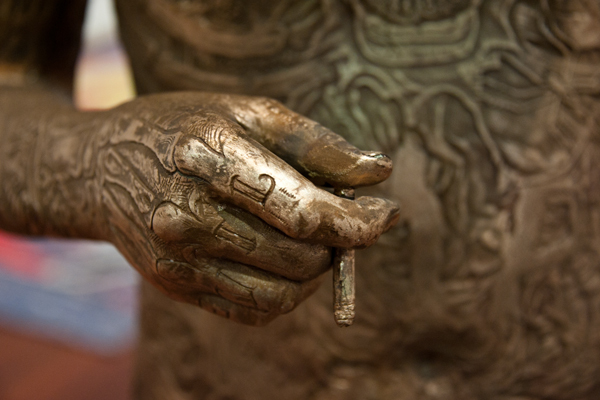 Kotatkova collaborated with patients at a psychiatric hospital outside Prague. 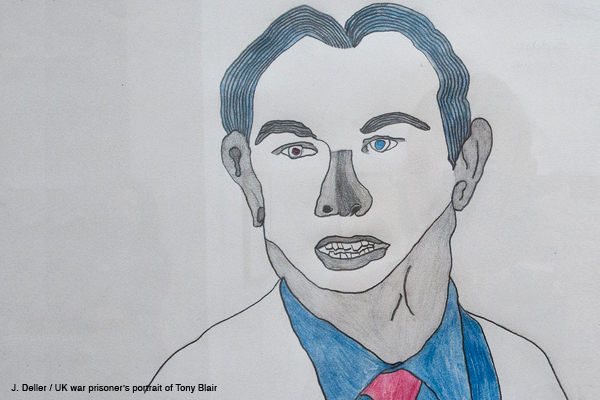 The individual pieces reflect patients’ social hierarchies and ways of communication. 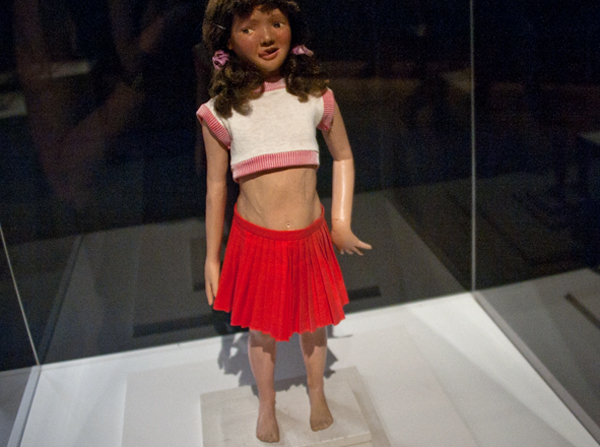 Bartlett‘s “anatomically correct” handcrafted dolls are said to represent imaginary family (Bartlett was an orphan). His sure had a preference for hot teenage sisters. Dolls, dollhouses and model houses were plentiful: Andra Ursuta created miniature detailed replicas of different rooms of the house she grew up in Romania. 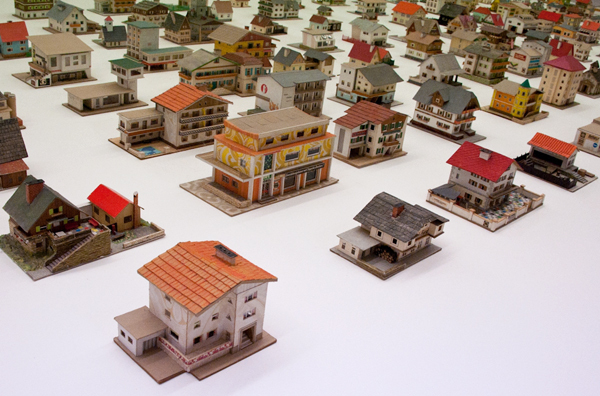 387 meticulously crafted model buildings of different provincial architectural styles created by an Viennese insurance clerk Peter Fritz around 1950-60 and saved in ’93 by Oliver Croy from a junk shop. Grand finale indeed. 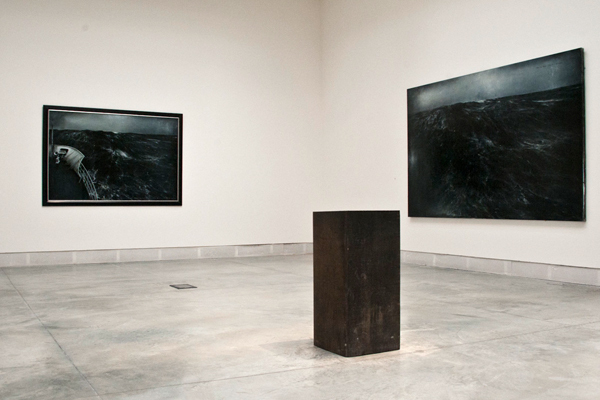 The combination of Serra‘s steel block installation and De Cordier‘s dark paintings is pitch perfect! of November. 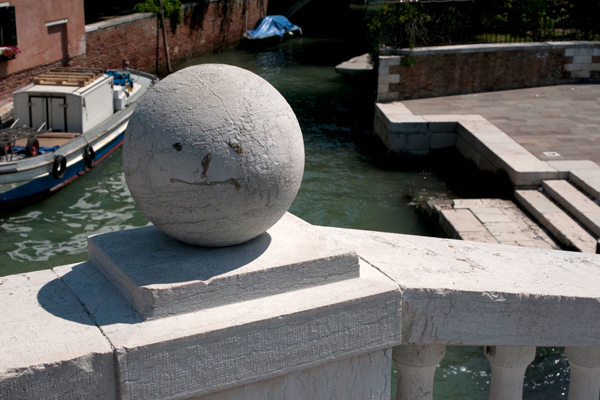 Coming up in the next series of posts is a roundup of our favorites from the Biennale itself, the collateral exhibitions across Venice as well as our picks of “bacari” (small Venetians bars) and places to escape when the art and tourist crowds get a bit too overwhelming. 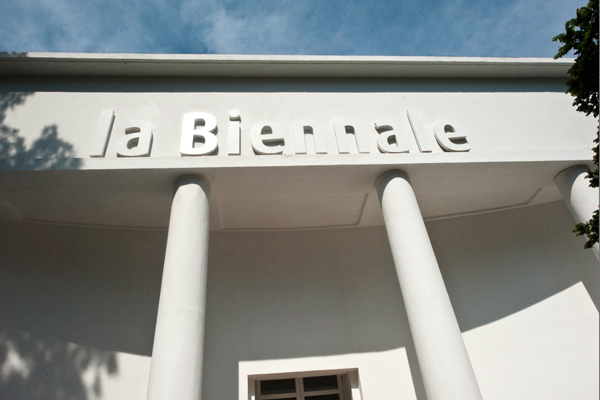 the Biennale has two main locations – Giardini, with thirty permanent national pavilions and the central exhibition hall, and Arsenale, displaying a themed exhibition. 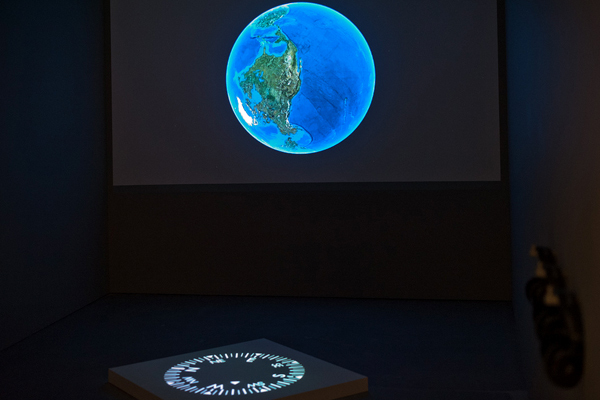 Titled Il Palazzo Enciclopedico, this year’s exhibition is curated by Massimiliano Gioni and evolves around the human desire to catalogue the world around them. 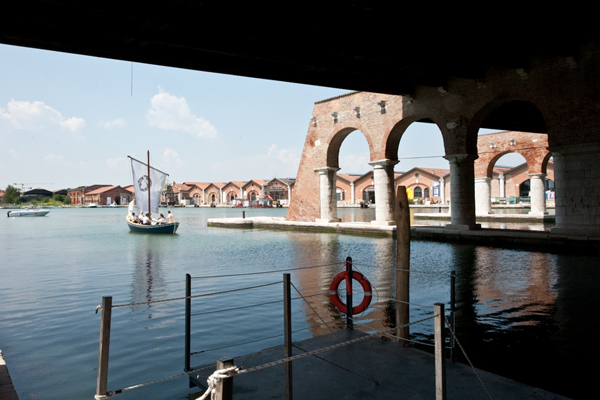 Some countries not owning a pavilion in the Giardini stage their national shows inside the Arsenale. 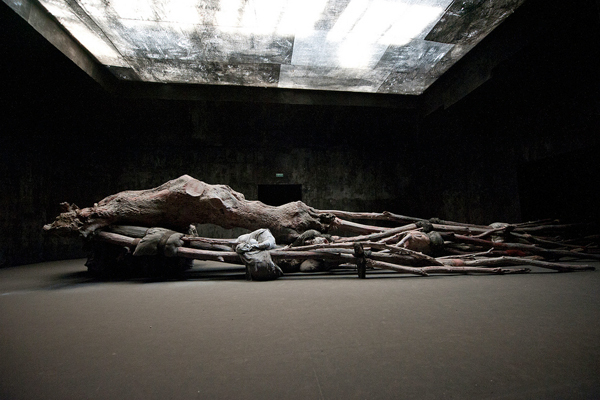 Prada Foundation to name just a few) to various group- and solo shows. 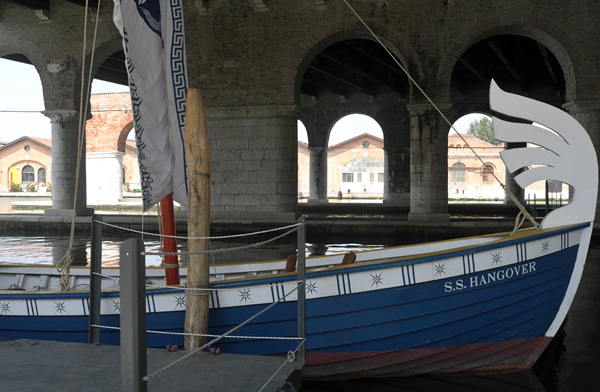 You can easily spend two entire days (or more) in Giardini and Arsenale and take time to enjoy the art as well as the settings: one of the best things about the biennale is the unique atmosphere of these two locations. 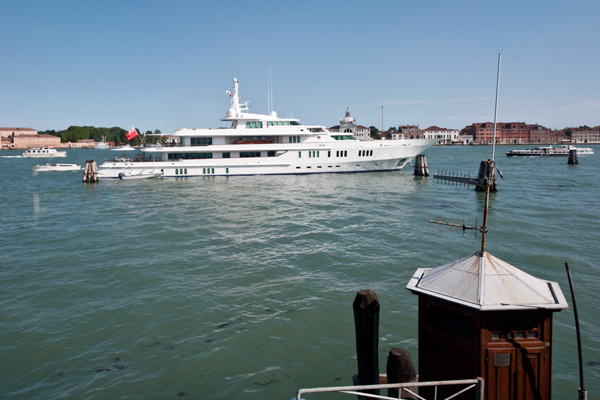 Same thing for the collateral shows spread throughout Venice – palazzos, canal views, vaporetto trips, handsome display of private yachts etc. 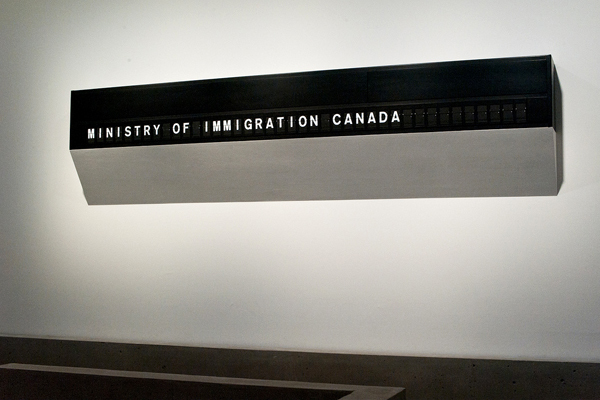 is at least as exciting as the art on display. 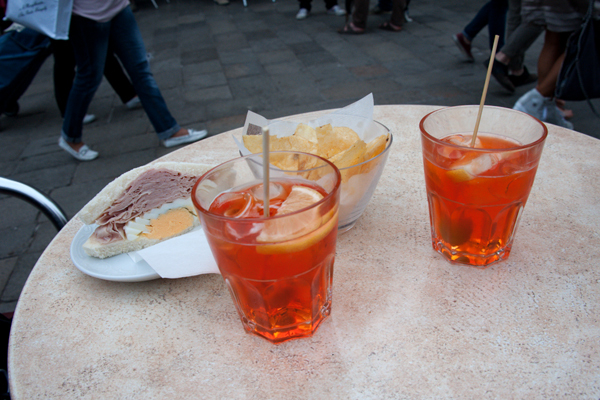 Finally: food, drinks and attitude to customers can be either amazing or horrible in Venice, depending on where you go. 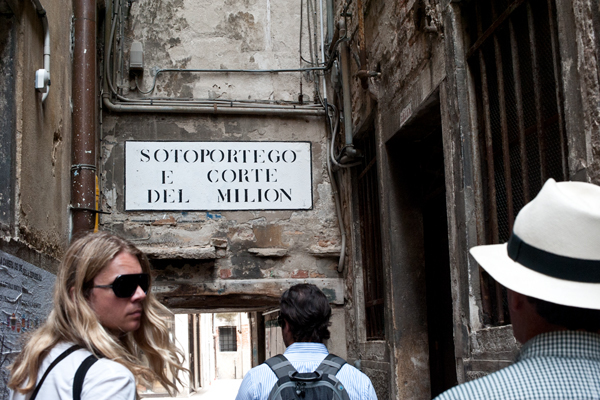 Coming up is a small selection of places we loved, from simple bars to the £30 per Bellini ones (ok, just once :-)).